Time was, he says, looking out over a mass of graphics cards that used to be fields when he was a kid, you didn’t need a power connector for your GPU. Not a lifetime ago, either. I’m talking fifteen years. No fans, no moving parts, no power connectors. Just a plain old PCB with ‘3DFX’ printed somewhere and 16MB of memory. For those who remember such days, it’s comforting to hear that Asus have managed to get NVIDIA’s GTX 950 operational at just 75W – enough to rely on power from the PCI-e connection alone. Sorted for graphics, but feeling a twinge in your wrist? Check out our best PC gaming mouse guide. The Asus GTX950-2G is powered by the same GM206 processing unit found in 960 and other 950 cards, albeit a stripped-down version designed to bring down the power draw from 90W, as with NVIDIA’s reference GTX 950, down to the required 75W. However, it’s still kitted out with OC and gaming modes, which give the GTX950-2G higher clock speeds higher than NVIDIA’s reference of 1024MHz base, 1188MHz boost. At its default ‘Gaming’ mode it’s clocked at 1026MHz base and 1190MHz boost, and in the more powerful OC mode it extends to 1051MHz base and 1228MHz boost. What will that yield in performance terms? Well, you won’t be playing Elite Dangerous at 4K and 60 fps, but a 950 at those speeds should at least generate 30 fps in The Witcher 3 at 1080p, so it’s a very viable budget card. 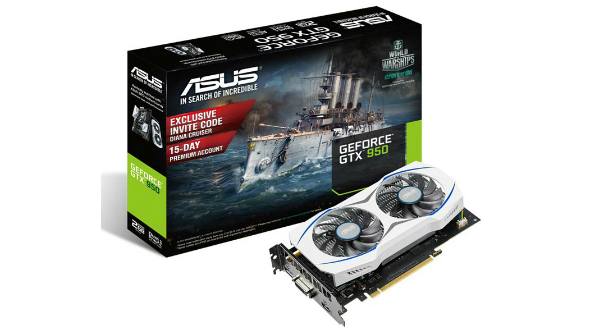 The exact nature of that budget is TBC – Asus has yet to release pricing details of the card, but current GTX 950 models retail at around the $180/£150 price point today. – Dimensions: 8.3″ x 4.5″ x 1.6″ Inch, 21 x 11.3 x 4 cm. This is a 2-slot graphics card design.